When you have made a concentrated game stock, you can sometimes save enough meat from the bones to make a tasty sauce. I had six kilo bones of hare and deer. When I had strained the stock I had almost one kilo of cooked meat. Being Dutch, I wouldn’t think of throwing that away. It was too much to feed it all to the cats, so I made this delicious pepper sauce with it. However, to get that leftover meat, you’ll have to pick over the bones very carefully after having strained the stock. The gristle has become quite gelatinous, and small pieces of bone will come loose too. Feel with your bare fingers to avoid breaking your molar over a tiny piece of bone. This sauce is a variation of the classic Italian Bolognese sauce. That one (at least, if you have a good recipe) has to simmer for a couple of hours at least. Because the leftover game meat has already simmered, this sauce will need less time. Within thirty minutes it’s ready to be served. 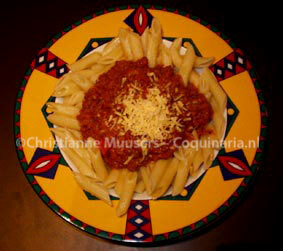 Pasta sauce for 4 persons; preparation in advance 15 minutes; preparation 15 minutes. Chop onion, stem celery, carrot and Parma ham into very small pieces, using a knife or a blender. Heat olive oil in a casserole, and fry these chopped vegetables and Parma ham until slightly browned. Then remove from the casserole. Chop the leftover game meat in the blender. With papardelle, tagliatelle, or just macaroni. The cheese is not sprinkled over the sauce, but served separately.This way you let everyone decide for themselves how much cheese they want to add. A delicious game sauce from leftover meat from making stock.